Waltzes with Giants is a moving portrait of one of the earth’s largest endangered mammals. Mystical and provocative, the book is inspired by a real North Atlantic right whale (Eubalaena glacialis) and her threatened migrations from Atlantic Canada to her calving grounds off the coasts of Georgia and Florida. In the spirit of marine biologist and conservationist Rachel Carson’s sea trilogy, the story evokes the wonder, the sorrow, and the conflicts associated with this member of the suborder Mysticetes (baleen whales). 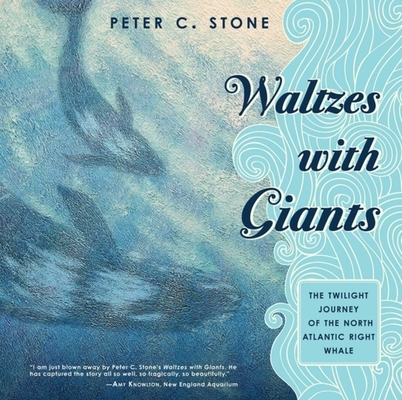 Blending sound science and art with a literary voice, Peter C. Stone takes us beneath the waves to reveal how we have historically decimated many species of whales and other species of fish and aquatic mammals for material gain, even though they are an integral part of the ecosystems upon which we depend. Supported by a glossary of scientific and book-specific words, as well as a list of resource links for the North Atlantic right whale and other marine mammals, Waltzes with Giants is built upon questions. While inviting us to imagine how our consuming culture impacts the ocean with fishing gear, waste, and noise, Stone’s passionate prose and “dreamy, evocative” (School Library Journal) paintings captivate readers of all ages by making science and the marvels of the oceans engaging and comprehensible.